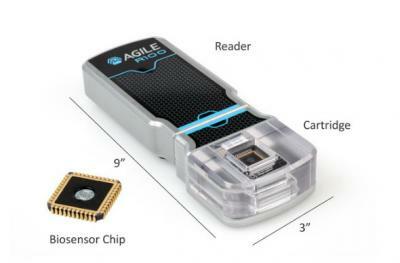 San Diego-based Nanomedical Diagnostics, established in late 2013 to develop cutting-edge diagnostics equipment, recently started shipping its graphene-based sensors and the AGILE R100 system which allows for real-time detection of small molecules - with no lower size limit. Nanomedical's graphene-based sensors enable faster sample processing, greater accuracy, portability and cost savings. TThe company's CEO, Ross Bundy, was kind enough to explain the company's technology and business to us. The Agile R100 is used in drug discovery and life science research, to evaluate what is known as kinetics - or "activity assay", which tells how quickly a drug molecule binds to its target at different concentrations - and how easily it falls off. This helps researchers evaluate different drug candidates to find the best ones to move forward with. Most tools on the market are optical tools - based on lasers and optical sensors and are large tools that cost a lot of money and require expert operators and may not quite fit smaller molecules. Nanomaedical's solution is an all-electronic, chip-based alternative. The basis of the system is the company's Field Effect Biosensing chip, or FEB.
Ross says that the company already has several customers - but it cannot disclose them all. They did supply its system to a lab at the University of California, San Diego - which was already used in several research activities. The UCSD researchers managed to achieve comparable or better data than regular tools - at a 1/1,000,000th of the sample size. Another customer that the company discloses is the lab of Dr. Mochly-Rosen at Stanford University, which also published several papers based on diagnostics performed using the AGILE R100 system. Nanomedical chose graphene because it is highly conductive and can be produced like a transistor on a silicon wafer. Graphene, unlike other conductive materials, can stay intact after exposure to oxygen rich environment, blood and serum. Using a special chemical process, the graphene is directly bound to to biological molecules such as proteins, and the the electrical potential of these molecules become the dominant drivers of the graphene conductance. When the drug comes in touch with the sensor, the interaction changes the conductance - which can be measured. The company says the its tools are vastly cheaper and simple to use compared to non-electronic systems. The price to the user is around $20,000 (compared to other tools that can reach hundreds of thousands of dollars in cost). The company's current system can do about 4 to 5 different molecules and 20-25 measurements in a day, and the next-generation high-throughput system (that will reach 8,000 molecules per day) is already in development. Nanomedical Diagnostics uses CVD graphene that it produces in-house. The company has its own growth-recipe and process (which, from start to finish, includes over 300 steps) - which they say is highly consistent - and far cheaper than 3rd party graphene. The company can currently make around 100 6-inch wafers per month (the yield is about 90%). A single wafer typically contains between 1,000 and 7,000 transistors, and the company plans to move to 8-inch wafers in the future.